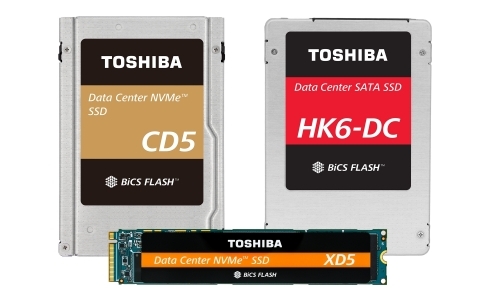 Toshiba Memory Corporation, the world leader in memory solutions, today announced its latest line-up of NVM Express™ (NVMe™) and SATA data center solid-state drives (SSDs) in multiple form factors. The new SSDs offer cloud data centers robust performance and reliability, and deliver lower operating power for read-intensive applications such as NoSQL databases, big data analytics and streaming media. They will support infrastructure managers in addressing performance and meeting consistent workload demands in data. Samples of the CD5 Series and XD5 Series of NVMe™ SSDs and the HK6-DC Series of SATA SSDs will be available to limited customers in the second calendar quarter of 2018. The new SSDs utilize Toshiba Memory Corporation’s 64-layer 3-bit-per-cell TLC (triple-level cell) BiCS FLASH™ 3D flash memory. In combination with controllers designed and developed in-house, the new SSDs deliver quality, reliability, and comprehensive customer support. The two PCIe® NVMe SSDs are designed to accommodate multiple data center workload profiles. The CD5 Series supports capacities ranging from 960GB to 7.68TB in a 2.5-inch form factor, and delivers up to 500,000 IOPS random read, up to 35,000 IOPS random write, up to 3,140MB/s sequential read, and up to 1,980MB/s sequential write performance within a 9-14W power envelope. The XD5 Series is a small-footprint M.2 22110 form factor SSD that supports capacities up to 3.84TB and delivers up to 2,600 MB/s sequential read and up to 890MB/s sequential write performance in a 7W power envelope. All three series are optimized for low latency and performance consistency in read-intensive workloads, for Open Compute Project (OCP) and hyper-scale/cloud applications. The HK6-DC Series is a 6Gbits/s SATA SSD and is available in 960GB, 1.92TB and 3.84TB capacities. It delivers a performance of up to 85,000IOPS random read and 16,000IOPS random write, and up to 550 MB/s sequential read and 500MB/s sequential write. The new data center SSDs also feature power loss protection and cryptographic erase support (SIE) for secure data erasure. Toshiba Memory Corporation will continue to contribute to the expanding data center market by providing industry-leading storage solutions utilizing cutting-edge flash technology. *NVMe and NVM Express are trademarks of NVM Express, Inc.
 Sanitize Instant Erase (SIE) is useful to reduce time and cost during system repurposing and disposal. SIE is compatible with the Sanitize Device Feature Set., the standard prescribed by the T10 (SAS) and T13 (SATA) committees of the American National Standards Association (ANSI), which makes it possible to invalidate data recorded on magnetic disks in the blink of an eye. CD5 Series support the SIE, SED and FIPS security functions as options. XD5 Series (3.84TB model only) and HK6-DC Series support the SIE security functions. Self Encrypting Drive (SED) supports the AES 256 bit cryptographic algorithm as one of the measurers to protect data confidentiality and safety in case of system theft or system asset disposal. FIPS-validated models support the AES 256-bit cryptographic algorithm. They are designed to the TCG (Trusted Computing Group) standard, and have achieved validation to U.S. Federal Information Processing Standard 140-2 (FIPS 140-2).